This sound is of the cracking and popping that sea ice makes. Ice makes loud noises underwater when it cracks. 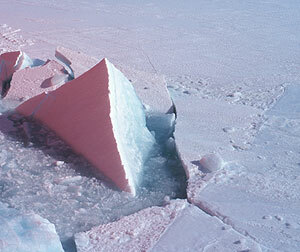 Sea ice cracks as the wind, waves, icebergs, and other sea ice push against it. Sea ice also makes groaning sounds as it is slowly deformed. Australian Antarctic Division- Sounds of Antarctica.